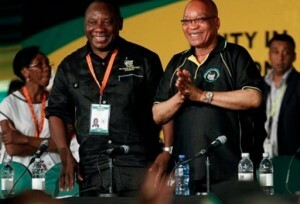 South African President Jacob Zuma has been re-elected as leader of the governing African National Congress (ANC). Zuma trumped his opponent Kgaleme Motlanthe by 2983 votes to 991. He will now lead the nation for another seven years. Business tycoon Cyril Ramaphosa was elected Deputy Leader of the ANC. Around 4,000 delegates cast their ballots on Tuesday at the ANC’s conference in Bloemfontein. The ANC celebrated its centenary this year in January. Meanwhile the markets reacted positively with the rand hitting a two-month high of 8.5125. South Africa’s economy is forecast to grow 2.5 per cent this year. Earlier in December, Zuma dismissed two downgrades by international ratings agencies this year, saying South Africa will surge back. “We want to dismiss the perceptions that our country is falling apart because of the downgrades,” he said. “We continue to do our development work, we continue to plan for a recovery,” said Zuma.